Can Nepal end child marriage by 2030? 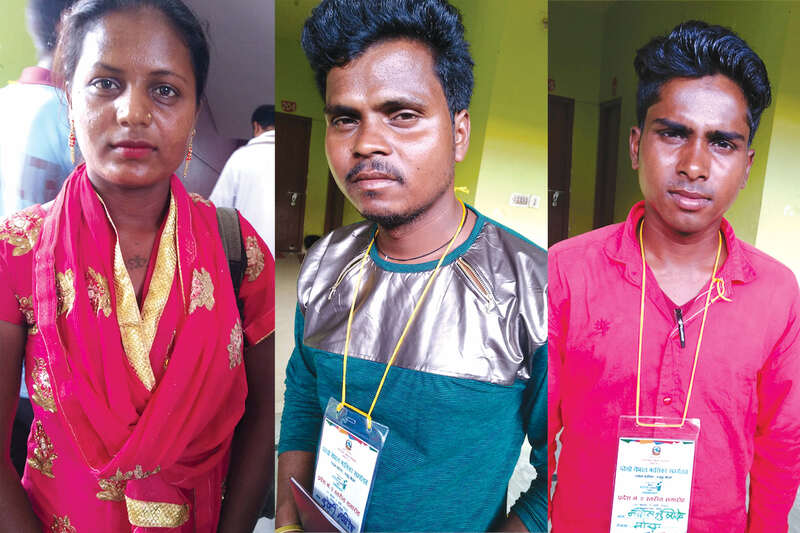 (Left to right) Soniya Kumary Sada eloped when 16 after her Grade 10 exam, but her husband is away at work in India and she is prevented from studying by her in-laws. Sudesh Rishidev from the Musar community was married at 18, at a time when he had no idea what a husband’s responsibilities were. Navin Rishidev is Sudesh’s friend and was married when he was 18 and his wife was 14 because his parents wanted someone to help with the cooking. Given Nepal’s poor record in enforcement and implementation, it is a given that here, passing laws are not enough. This is glaringly evident in the average age of marriage, which is stuck at 18 despite law raising the minimum marriage age to 20. Data shows that 37% of girls in Nepal marry before the age of 18, and 10% are still married by the age of 15. This is the third highest rate of child marriage in South Asia after Bangladesh and India. Despite the rise in female literacy child marriage has not gone down significantly. This is taken as a proof that education is slow to reform deep-rooted patriarchy. Child marriage is highest in districts with low female literacy and the Tarai districts have a particularly high rate. Experts say that even if marriage age can be deferred to 16 for boys and girls in the Tarai, it will be an achievement. This has thrown the government’s target to eradicate child marriage by 2030 in doubt. At a Girl Summit for the youth of Province 1 and 2 here last month, local government officials, lawmakers all made the right noises, expressing commitment to meet the zero child marriage goal by educating, empowering and employing girls. They heard from adults who were married when they were children, and were informed of pressures in male-dominated society from family and the influence of the Internet in encouraging early relationships lately. The Summit’s motto was: ‘Educate Girls To Save Girls’. Sudesh Rishidev from a Musar community in Rangeli of Morang was 18 when he was married and did not know a husband’s responsibilities. “I knew I had to look after my family, but did not know how,” recalls Rishidev, now a 26-year-old anti-child marriage campaigner. Navin Rishidev is Sudesh’s friend and is now 28, but he was married when he was 18 and his wife was 14. His parents had five other children, and wanted him married only so they could have a daughter-in-law to help with the household chores. Today Navin is a well-known Maitihili singer and uses his musical talent to raise awareness against child marriages. Soniya Kumari Sada from Chandranagar eloped with Indrajit Sada when she was 16, just after her Grade 10 exam. However, with her husband working in India, her in-laws refused to let her study and banished her back to her parent’s home. She is now worried about her future. Pooja Shah, 18, from Janakpur had to take care of her mother and three siblings after her father died. Relenting to pressure from her mother to get married, she wedded 21-year-old Sarkar Shah, but says: “I did this for my mother, who was facing financial pressure to raise the family.” She is sad about dropping out of school, but understands why her mother forced her to do it. Rani Mahato is now 37 and an active member of a political party, but was married when she was 11. “I was not even aware that I had been married,” recalls Mahato, who is now district vice-chair of her party. She is glad the average age of marriage has climbed to 17, even though it is still low. Ajay Kumar Rishidev, from Morang is now 23 and in Grade 12. He is under pressure from family to get married but has evolved a clever strategy to deal with it: he brings his friends to talk to his parents, or he disappears from his home when he hears that prospective bride families are visiting. This has helped him to stay single till now, an he is involved in performing street dramas to show the Musar communities reasons on why child marriage deprives women of opportunities in life. Saroj K Patel, ward Chair of Jeetu Simra Sub Municipality in Province 2, is with the Rastriya Janata Party, but says the campaign against child marriage crosses party lines. But he adds that banning registration of marriage below 20 is depriving many young married women of their rights. Chief Minister of Province 2 Lal Babu Raut is convinced that increasing female literacy is the first order of business to fight patriarchy and caste system that lie at the high rate of child marriages in the Tarai. He is trying to amend the relevant clauses in the Civil Laws, and impose a 50% quota in the provincial police.